Andrew Augsburger was issued the oath of office as Auglaize County’s municipal court judge during ceremonies Friday. Common Pleas Court Judge Frederick Pepple issued the oath as Augsburger’s wife, Candice, held the Bible. Augsburger succeeds Judge Gary Herman, who retired after 36 years on the bench. WAPAKONETA — Surrounded by a courtroom filled to capacity with his family, friends and professional colleagues, R. Andrew Augsburger recited the oath of office Friday as Auglaize County’s new municipal court judge. It’s been more than three-and-a-half decades since the county courthouse played host to a similar scene with a new face. Augsburger will take his seat behind the bench on Jan. 1 as the successor to Judge Gary W. Herman, who chose not to seek re-election this year and capped at 36-year career as Auglaize County’s municipal court judge at the close of business on Friday. Augsburger, who resides in Wapakoneta, cruised to an easy victory in the November general election, collecting 68 percent of the vote in his race against St. Marys resident and fellow Republican David Weilbacher. Augsburger served as assistant prosecuting attorney in Auglaize County for the past 21 years. 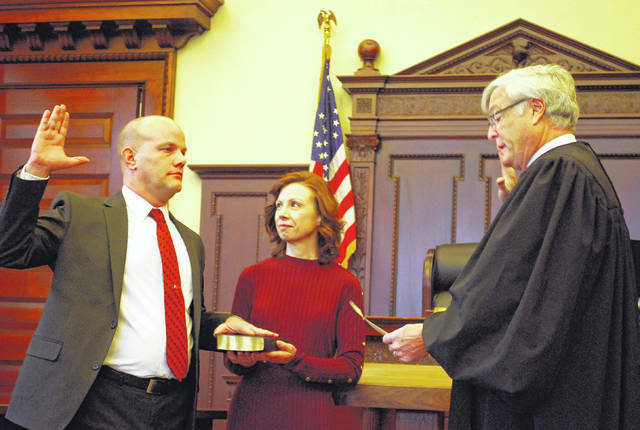 Frederick Pepple, judge of the Auglaize County Court of Common Pleas, issued the oath of office to Augsburger as the new judge’s wife, Candice, held the Bible. Following the oath, the new judge thanked Herman, Pepple and Domestic Relations Court Judge Mark Spees for the wisdom and guidance they imparted over the years. Auglaize County Prosecuting Attorney Ed Pierce said Augsburger will be missed. “I’m losing 20 years of experience, but we’ve had an extra person on staff for the past year, in anticipation of Andrew winning this election, so we’ll hit the ground running” when 2018 rolls around, Pierce said.